We live in a fairly roomy house in Denver. Despite the fact that it was built in the 1970s when often homes lacked a lot of places to keep excess things (because frankly, back then people didn’t really have excess things like they do now), there is considerable storage space. The house has large closets, lots of cupboards, a fair amount of countertop space, roomy cabinets, a pantry, an attic, and lots more storage in the basement. Lots of storage space is a blessing and a curse, at least for me. I am the queen of if there is space, it will be filled. I have so much storage that is out of sight, i.e., in the basement, and that’s where I keep things like the popover pan I’ve used only once, the French bread pan I’ve used only once, the wicker dumpling steamer that I have used only once (are you sensing a pattern? ), and the punch bowl that I have used on several occasions but will almost certainly never use again. There’s a Fry Daddy, a Seal-a-Meal, two ice cream makers, an electric wok, and a partridge in a pear tree. Well, not that last thing. But lots and lots of stuff. Our house here in AZ is a mere 1,300 square feet in which there are often three adults residing. We have a small kitchen with a smattering of counter space. There is a small pantry, and a few below-counter cabinets and above-counter cupboards. Space is at a premium. Bill has installed a few cupboards in the garage. Which (finally) brings me to the point of this post: Crock Pots. I have long been a fan of crock pots. For working people, I think they are life savers. If you can get yourself organized either early in the morning or the night before and get ingredients into a crock pot, you have dinner waiting for you when you get home. I, of course, am not a working person. I could spend the entire day cooking if I wanted to. Which I don’t. But I still am a big fan of slow cookers, primarily because if I put food in the slow cooker at 10 o’clock in the morning, I will not talk myself out of cooking and into going out to eat at a restaurant at 6 o’clock. At some point after we bought this house and Bill and I started spending entire winters here, I decided I needed to get a new crock pot. My existing crock pot was literally from the 1970s, and though it worked just fine, I wanted one that was oval. I think at the point I purchased the new crock pot, I had fallen prey to the Mississippi Pot Roast craze, about which I blogged here. Unfortunately, the roast wouldn’t fit properly in my existing crock pot, so I ended up borrowing one from my niece Maggie. Shortly after, I predictably went and purchased my own oval crock pot – a 6 quart pot in which I could cook the CU Buffaloes’ mascot Ralphie. It worked fine for the one-and-only time I made the Mississippi Pot Roast (as I was frankly underwhelmed. The pot roast that owns the internet indeed!). But it didn’t take long for me to realize that a 6 qt. crock pot is far too big for the meals that I cook 99-and-44/100th percent of the time (for Bill and me). So the other day, I spontaneously went to Target and bought a 4 qt. crock pot. I brought it home and used it to make smothered pork chops with mushrooms. As I dumped all of the ingredients into the crock pot, I quickly realized that despite being two whole quarts smaller than my other crock pot, it was still too big. At the crack of dawn the next day, before I could give myself time to reconsider, I went onto Amazon and ordered (with one click!) a two-and-a-half quart crock pot. Voila! It’s perfect. Except for the fact that I now own four (count ‘em) crock pots in a house which, if you will recall from this exceptionally long and boring post, HAS NO STORAGE SPACE. Jen’s going to be very surprised when she comes next to AZ and finds her bedroom filled with crock pot boxes. Just kidding, because by time you read this post, my niece Kacy will have picked up my 4-quart crock pot which I brilliantly thought to give her, as she actually IS a working mother with three small kids. And look at the little teeny tiny crock pot on the right. It doesn’t count because it is so small. Right? For good measure, here is a recipe I recently made in my crock pot. I’m sorry for the poor photo. At some point I will remember to not shoot photos of my food when it sits on a yellow plate. Everything looks a sad color of orange…. Season beef with salt and pepper as necessary. Brown pieces of beef in the vegetable or olive oil until seared nicely. Put into slow cooker. Add the beef broth, onion, soup mix, steak sauce, garlic, horseradish, mustard, salt, butter and mushrooms to the crock pot. Cook on low for 7-8 hours. Mix cornstarch and cold water, and add to the mixture, stirring well. Turn to high and cook for 10 minutes more or so, until the sauce begins to thicken. Serve over noodles, cooked as instructed on the bag or box. 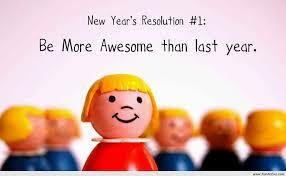 It’s about this time every year that I do my annual New Year’s resolutions post. You know, where I say that I am going to pray more, eat less, exercise more, worry less, drink more water, drink less alcohol. And then, by the end of January, I am back to barely remembering my morning prayers, half-heartedly dragging myself to the gym once in a while with absolutely no enthusiasm, drinking less water and drinking more alcohol and worrying about my lack of commitment. Sigh. So I decided I’m going to forgo resolutions and just think more about what I would like my 2017 to look like. And that’s a pretty easy task. I would like to not see the inside of a hospital, or even an emergency room, in all of 2017. I don’t know if this is possible, but what I do know is that it has been an entire year since I’ve been admitted to a hospital, and despite a couple of ER visits, my overall health seems to be better. I don’t know if I can attribute this to my low-fiber diet and my increased water intake, but I know that both of those things haven’t hurt. Keep up the good work, Kris! 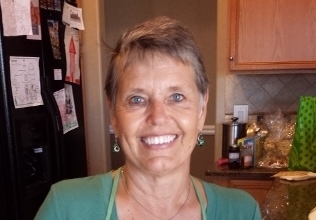 Bill had his semiannual appointment with his neurologist’s office right before Christmas to measure his Parkinson’s progression, and we were blessed to learn that there has once again been very little progression. So little, in fact, that the PA with whom he meets (because the doctor doesn’t even feel he needs to see him more than occasionally since he is progressing so slowly) suggested we might not have to come every six months. Bill and I nodded, but admitted afterwards to each other that we feel better getting their outlook every six months. But when we honestly answered her question about how often he — and by association, I — exercise, she would have said tsk, tsk if people actually said tsk, tsk. Interestingly, she told us that his doctor (who is quite renowned within the field of neurology and movement disorders) believes that regular aerobic exercise is as beneficial to people with Parkinson’s as are the medications they take. And while the meds can often have yucky side effects, aerobic exercise does not. I wish that eating rib eye steaks and drinking martinis was just as effective, but I’m afraid it isn’t. So, it’s back to the gym, and not begrudgingly either. After all, God has been good enough to keep his progression slow, so we can do our part. I think that for the most part, I am a positive person. As Bill is reading this statement, he is trying not to laugh. He would tell you that I worry about everything, and he is, in part, right. I tend to worry about a lot of things, many of which never transpire. He, on the other hand, worries little, and only about very specific things, but otherwise, lets life play out however it will. I feel compelled to say that life often successfully plays out for him because I worried about something and therefore was able to avert disaster. Let’s just say that had he been responsible for Christmas presents, he would have nine grandchildren looking at the absence of presents under the tree and saying, “Why Santy Claus, why?” just like Cindy Lou Who. Regardless, I want my 2017 to be positive. While 2016 wasn’t as bad a year for me as I hear many people complaining about, there were still many things that stunk. A friend was diagnosed with cancer. Our country went through a very difficult and divisive presidential election. Our grandson Micah gave us a medical scare when he aspirated a rock into his lung, requiring emergency surgery. I will admit that part of me is sad to say goodbye to every year because as you age, the years go by more quickly and the end of life (which young people think will never come) looms ominously closer every day. But there is no point in concentrating on the negatives when there are so many positives in my life. And that’s what I intend to remember this year. So when I think about what I want my life to look like I 2017 as I indicated in the very beginning of this post, I realize that I want it to be full of smiles and joy and things that are good for me, like good books, great friends, awesome family time, great food, interesting travel, and lots of hugs and kisses from grandkids and friends and my husband. 2017: Watch out; here I come! 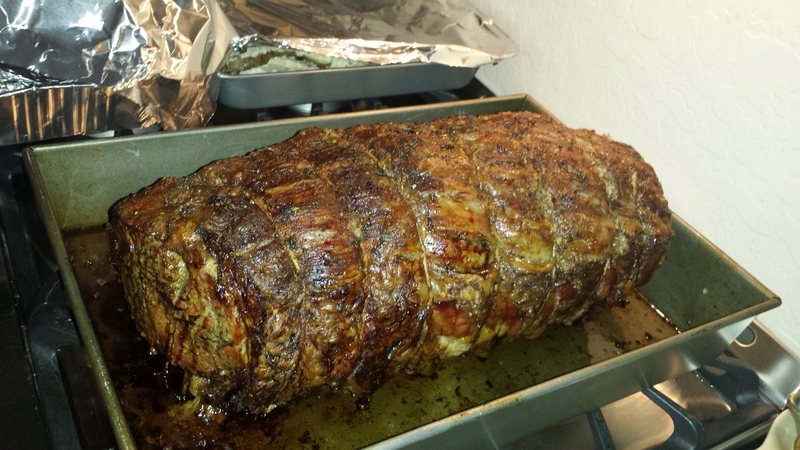 For good measure, here is the recipe my family uses for our annual New Year’s prime rib. I offered it to you a couple of years ago, but it’s time to give it to you once again. Grind peppercorns and salt to a powder in an electric coffee/spice grinder, then transfer to a mortar. Add garlic, thyme, and rosemary, pound to a smooth paste with pestle. Stir in oil. Rub paste over roast. Transfer roast to a rack set in a small flameproof roasting pan. Marinate, covered and chilled, at least 8 hours or up to 24 hours. Let roast stand at room temperature 1 hour. Preheat oven to 450 degrees. Roast beef in middle of oven 20 minutes. Reduce temperature to 350 degrees and roast beef until a thermometer inserted into center of meat registers 110 (for very rare, 120 for medium), 1-1/2 hours to 1-3/4 hours more. Transfer beef to a large platter and let stand, uncovered, 25 minutes. Meat will continue to cook, reaching about 130 for medium rare. By the way, saying that my sister snickered was also literary license. But back to turkey tetrazzini. I admitted to my sister that I had, in fact, never made turkey tetrazzini using my turkey leftovers. I have made turkey noodle soup. Turkey pot pies are a common post-Thanksgiving meal that I make. Bill loves when I simply throw the leftover turkey into the leftover gravy, and serve it over a slice of white bread with a side of leftover mashed potatoes. But no turkey tetrazzini. I mentioned “inevitable turkey tetrazzini” because I always saw it as the leftover turkey meal of choice in Redbook and Good Housekeeping. I think it’s been around for decades. My mom might have even prepared it with leftover turkey. It just has a 1960s feel to it, doesn’t it? Hold that turkey tetrazzini thought, because I want to digress to something only marginally related. The matter of the turkey carcass. Somewhere near the end of our Thanksgiving meal, a discussion ensued about what was going to happen to the turkey carcass. Or, in our case, the turkey carcasses. There was a point when I thought we might be moving to the living room to perform feats of strength with the carcasses being the grand prize. Thankfully, Allen and I took the high road and backed away, leaving the carcasses to Court and Alyx’s mom Manith. I suspect that two superb pots of soup have recently been made from those bird skeletons. But back, once again, to turkey tetrazzini. A day or so following Thanksgiving, I finally had time to begin perusing my Food Network Magazine that featured their Thanksgiving ideas. 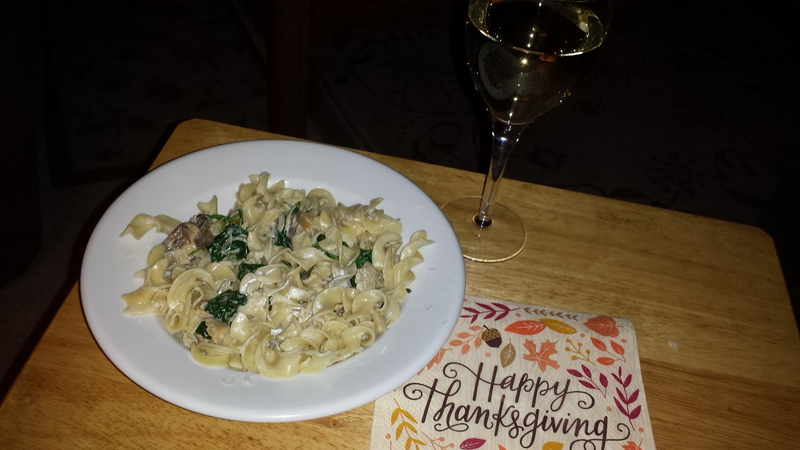 Lo, and behold, what should appear but a recipe for turkey tetrazzini. Yes indeed, in something as fancy schmancy as Food Network Magazine. I took a gander and liked what I saw. This was not your mother’s turkey casserole featuring cream of mushroom soup and cheddar cheese and baked at 350 until the turkey is so dry it gets stuck in your throat. In fact, it didn’t go into the oven at all. And in place of cream of mushroom soup, the recipe called for — wait for it – a cup-and-a-half of heavy cream. As I perused the recipe, I noticed that I had every single item in my pantry and/or my refrigerator. I will never again poke fun at turkey tetrazzini, because Bill and I almost licked the pan clean. How do you go wrong with something that includes cream, parmesan cheese, mushrooms, and wine? Cook the noodles in the salted water as the label directs. Reserve ½ c. cooking water, then drain. Toss with 1 T. butter and season with salt and pepper. Meanwhile, heat the remaining 2 T. butter in a large skillet over medium heat. Add the onion and celery and cook, stirring occasionally, until slightly softened, about 3 min. Add the mushrooms, thyme, ½ t. salt and a few grinds of pepper; cook, stirring occasionally, until the mushrooms are soft and lightly golden, 6-7 min. Add the wine and cook until absorbed, about 1 minute. Add the heavy cream and bring to a boil. Reduce the heat to medium low and simmer, stirring occasionally, until the sauce is slightly thickened, 4-5 min. Stir the turkey and spinach into the sauce and cook until the turkey is warmed through and the spinach is wilted, about 3 min. Stir in the reserved cooking water and return to a simmer. Remove from the heat, and stir in 1/3 C. parmesan cheese. Add the noodles to the turkey mixture. Sprinkle with the remaining parmesan. Bill and I woke up yesterday morning, happy that it was Tuesday which meant we didn’t have to go to the gym, and with no particular plans for the day. “What do you have on your schedule today?” I ask him every single morning despite the fact that I know the answer is “nothing particular” seeings as we’re retired. Although I should recall that the answer could be, “I plan to make a four-tiered lemon-and-rosemary flavored wedding cake using homemade fondant accented by the fresh roses I have been growing in the greenhouse I secretly built in the back yard.” You never know with Bill McLain. As Lucy (of Peanuts fame) would say, of all the Bill McLains in the world, he’s the Bill McLainiest. “Why don’t we take a field trip to Tempe, drive by Sloan Park (spring home of the Cubbies), have lunch at Portillo’s, and stop by Jo-Ann’s Fabrics so I can buy some yarn?” I said, the final part said under my breath with the hope that he stopped listening after I said lunch at Portillo’s. He had. It has been extraordinarily nice for the past couple of weeks. I know I can’t brag too much, because I think it has been quite nice in Colorado as well, and while everyone expects it to be in the 80s in Phoenix, high 50s/low 60s in Colorado is a special treat. Still, a day doesn’t go by that I’m not grateful for the warm sunshine and the beautiful flowers. 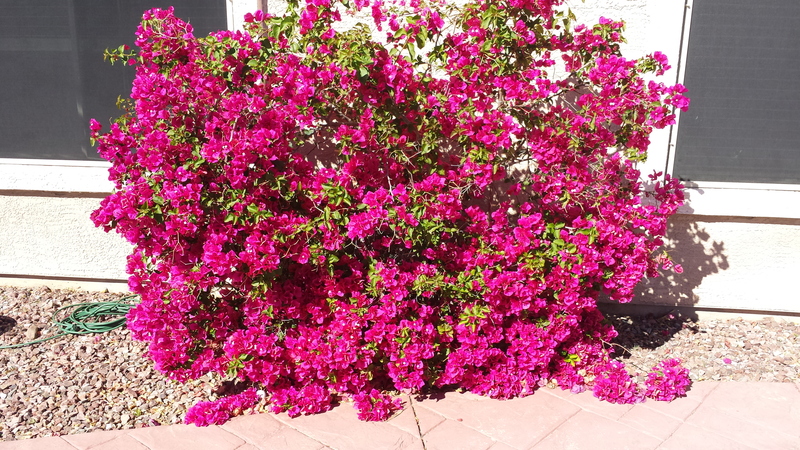 Look, for example, at the bougainvillea bush in our backyard….. When we got here a month or so ago, the bush looked like it was on its last legs. It was spindly and it had few flowers. What a difference some warm weather makes. Anyway, the nice weather called to us, and the day was fun. There were many, many folks at Sloan Park. I think maybe the Cubs pitchers and catchers are going to report any day now, and methinks a few might have been there already, judging from the number of people with their heads plastered against the fence looking into the practice fields. We also saw a number of kids with autograph books shoved into the front drivers’ side window of an SUV with tinted windows, and I don’t think the driver was a member of the maintenance crew! Portillo’s, of course, is a wonderful family restaurant based in Chicago. In the past few years, they opened a couple of them here in the East Valley – the one very near Sloan Park (no surprise there) and another in Scottsdale, just a stone’s throw from Salt River Fields at Talking Stick, the spring home of the Arizona Diamondbacks and the Colorado Rockies. Portillo’s has All Things Chicago, but Bill and I go for the Italian beef sandwiches every time. Bill gets his wet (which means they pour the gravy on the sandwich) with sweet peppers; I get mine dipped (which means they literally dip the entire sandwich in the gravy) with hot peppers. There are advantages and disadvantages to getting the sandwich dipped, the biggest disadvantage being IT IS A SLOPPY MESS THAT MAKES YOU FEEL AS THOUGH YOU NEED TO GO HOME AND TAKE A SHOWER. But yummy. One of my goals for Lent was to eat simpler. One way I thought we could do that was to serve soup one night a week. I decided last night was a good night to do that since we’d had a sizable lunch. I’ve been meaning to make my mom’s vegetable beef soup for some time now, and I took the plunge last night. 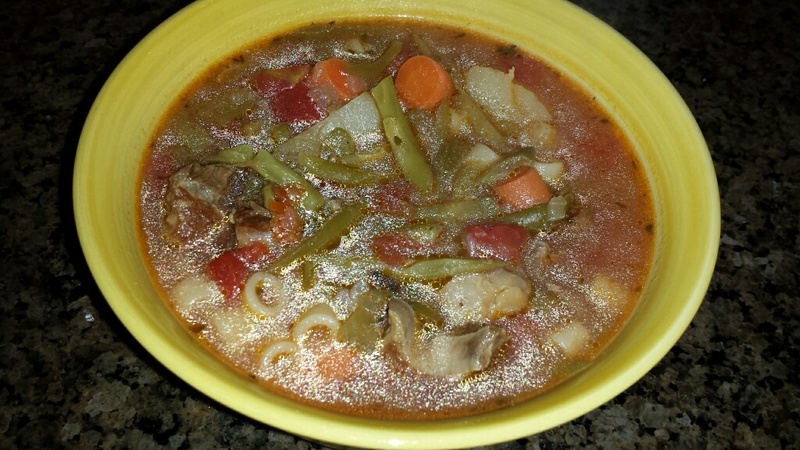 Here is my mom’s recipe, verbatim from her recipe card…..
Cook 2 beef shanks in approximately 6 cups water with 1 chopped onion, 1 stalk celery, 1 c. cabbage; add parsley, salt to taste, pinch of leaf oregano, leaf thyme, and a bay leaf, also a small can of Del Monte stewed tomatoes. Cook 1 hour, then add carrots and potatoes. About 15 min. before serving, add noodles. Nana’s Notes: I modified the recipe a bit. 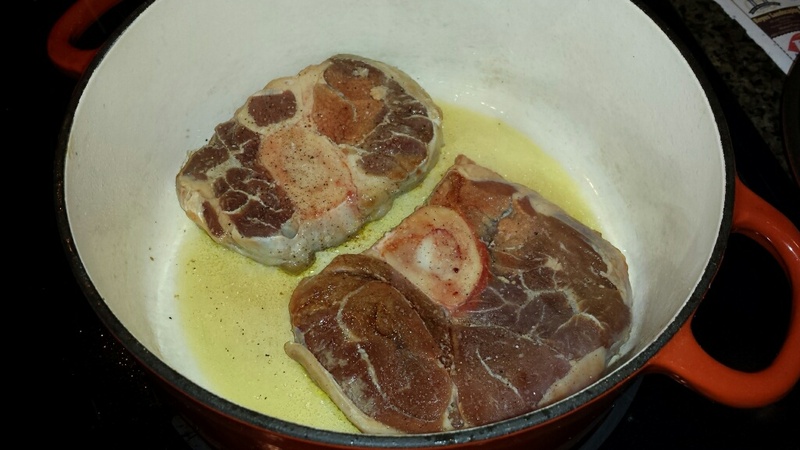 I browned the beef shanks in a Dutch oven, then added 6 c. water to the beef. I also added 1 chopped onion; 1 stalk celery, chopped; and the same herbs. I let that cook for about 2-1/2 hours until the meat was very tender and fell off the bone. I removed the bones and returned the cut-up meat to the liquid. I added a can of diced tomatoes, one diced potato, a couple of chopped carrots, and a can of green beans (because that’s what I had on hand). I didn’t add cabbage because I’m not supposed to eat cabbage on my new low-fiber diet. I cooked the noodles separately and added them at the end. It was very good, and the first taste made me think of Mom. So, now that I’m out of the hospital and feeling better, I am taking the next step of getting used to my apparent new diet that consists of very little fiber. My hope is that I have fewer (or no) intestinal obstructions. My fear is that I will blow up like a balloon and eventually POP due to a fiberless existence resulting in, well, you know. I went to see a gastroenterologist Monday afternoon, and unfortunately, he confirmed the need to limit my fiber if I have any chance of preventing further obstructions. LOW fiber, he emphasized, not NO fiber. Folks on the internet called it a low-residue diet, as they clutch their tummies and eat their yogurt without berries. The doctor said an absolute no-no to apples or pears with the skin, popcorn, sweet corn, citrus fruit, nuts, and tomatoes with the skin. He listed those just off the top of his head. Further research on low-fiber, er, low-residue diets indicated I am able to eat zucchini (no skin), cucumbers (no skin, no seeds), asparagus with the woody part removed, carrots cooked to an inch of their lives, mushrooms, lettuce, very ripe bananas, soft melons, applesauce, peaches, apricots, most dairy (as long as there are no nuts or berries), most meat, poultry, and fish, and white bread, white pasta, and white rice. In other words, consider the diet that doctors have BEGGED us to eat for years, and eat the opposite. Perhaps I should just eat Gerber baby food. The only good news about the whole thing is that I can eat Frosted Flakes without feeling guilty. No fiber. Lots of sugar, but no fiber. Oh, and martinis have absolutely positively no fiber. I’ll happily forgo the olive. I’m speaking tongue- in-cheek of course. Not about the diet. That, I’m sorry to say, is reality. Or at least my reality until someone wearing a doctors’ coat tells me something different. The tongue-in-cheek part comes in my complaining about it. Because I have said it all along, and I will say it again, if I can eat or not eat something that will subsequently prevent me from a bimonthly hospital visit with a plastic tube inserted down my nasal cavity, I will do it. And not complain. Much. But I am dangerously close to become one of those people. You know, the people for whom you have to cook special meals. I’m not complaining about those people because our daughter Heather has celiac disease and if she eats gluten, she gets very sick. So people cooking for her have to be careful that they aren’t accidentally poisoning her. She, by the way, has a very good attitude about her dietary limitation. She told me once that she was asked if she liked gluten-free beer. Her answer was, well, not particularly, but it’s what I can drink if I want to drink a beer, so what’s the use of complaining. I want to – and plan to – adopt such a good attitude. Because the reality (and the good news) is that I have to eat low fiber and NOT that I have to figure out how to survive a few more months with liver cancer. So wah, wah, wah and keep your perspective straight! Here is an example of the meal that I cooked last night, thanks to the Pioneer Woman. Slice the potatoes really thin using a mandolin or a really sharp knife, the thinner the better. 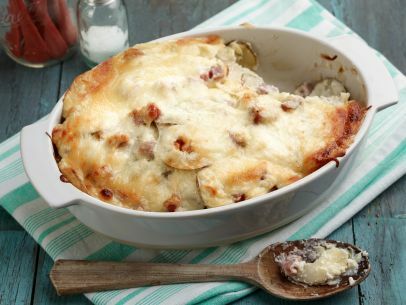 Generously butter a 2-quart baking dish, then add half the sliced potatoes and half the diced ham. Sprinkle on half the cheese then pour on half the sauce from the skillet. Repeat with the rest of the ingredients, ending with a layer of cheese and sauce. Sprinkle extra pepper on top. Cover the dish with foil and bake it for 40 minutes, then remove the foil and bake until the cheese is golden brown and the sauce is bubbling, an additional 20 to 30 minutes. Sprinkle with chopped parsley if desired and serve it up. My son’s guest post this past week on his culinary adventure involving the tongue of a cow generated lots of talk and opinions. Frankly, most people said, “No thanks.” Others proclaimed they grew up on a farm and were used to eating all parts of an animal. My brother promised he was going to bring me a lengua burrito from a place called Erickberto’s that I would most certainly like. We’ll see. The whole experience made me recall the andouillette sausage Bill and I ate, quite by accident, while in Europe in 2008. We were driving in France, near the Germany border. We stopped for lunch at what was for all intents and purposes a truck stop that offered a buffet. We chose our food items. Having never met a sausage I didn’t like, I chose a sausage for my lunch. I took a bite, and thought, hmmm, that’s actually quite nasty-tasting. I offered a bite to Bill and he agreed. Later, I looked at our bill and noticed that what I had eaten was andouillette sausage, the one thing that travel guide writer Rick Steves urged his readers to NEVER EAT. When we got to our hotel, I logged on to my computer and Googled “andouillette sausage” and immediately wished I hadn’t. Andouillette sausage is made, frankly, from the colon of a pig. It smells like it and it tastes like it. And that’s all I’ll say about that. 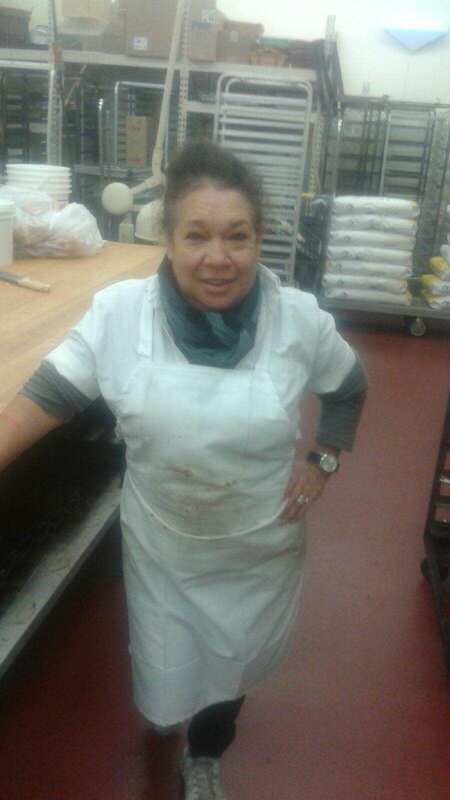 Gloria tells my brother David just how to make the world’s finest tacos de lengua. Wash but don’t clean the top skin. Boil for 30 minutes with onions, whole garlic, garlic salt and a spice of which she couldn’t remember the name. After it’s boiled, clean it. 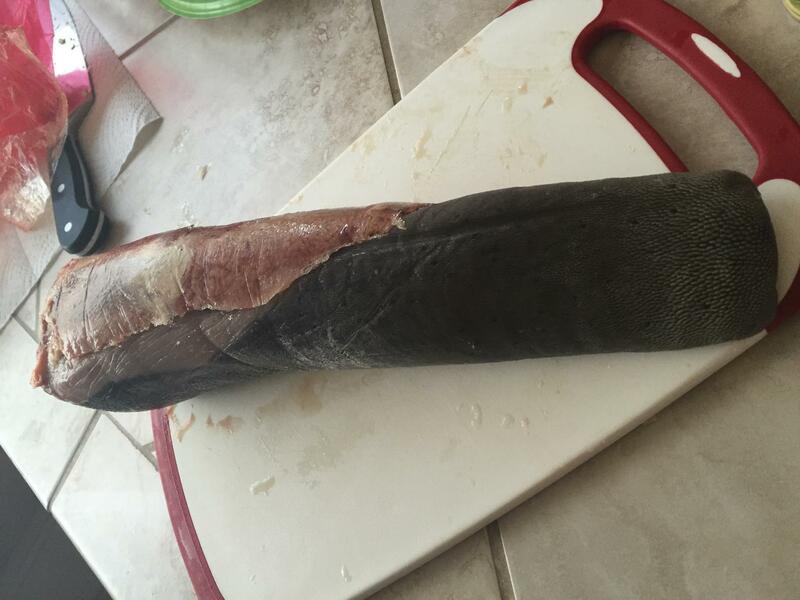 The skin comes right off. Put on a corn tortilla, cilantro, onion, and jalapeno. Enjoy. But perhaps my sister Jen had the best idea. You know how people have Meatless Mondays? She suggested I start a regular Tuesday blog post entitled Tasty Tongue Teasers Tuesday, and feature a weekly tongue recipe. Hey Vinnie, Where’s the Beef? When I actually worked for a living, I had the opportunity to eat at a lot of really nice restaurants all around the United States. You know, the restaurants where you are served a tiny piece of Mozambique tilapia with stewed raspberries and capers drizzled with Sicilian olive oil on an oversized, square white plate, costing somewhere in the neighborhood of $50, salad not included. For the most part, those meals were delicious and I was able to try a lot of foods I wouldn’t have been able to try otherwise. I am grateful to have had that opportunity. But for the most part, I am a simple eater. And thankfully, so is my husband. When I told Bill I would take him anywhere he would like for his birthday dinner, he chose a place famous for its fried chicken. And as I go through my recipe files – those on Pinterest and those in my recipe box – the fanciest recipe I have is Coq au Vin. And I haven’t made that for years. Bill grew up in Chicago – the food capital of the United States in my opinion. If you go downtown, there are innumerable fancy restaurants, similar to those I enjoyed earlier in my life. But the restaurants that Bill enjoyed were not really restaurants at all. They were food joints on the South Side of Chicago. Hot dog stands. Gyros places. Pizza parlours. If he was feeling really fancy, he might go to a locally-owned steak house where they still have red leather booths and serve a relish tray before bringing your salad made out of crisp iceberg lettuce and carrots. And when we go to Chicago to visit his mother, those are the places we dine. 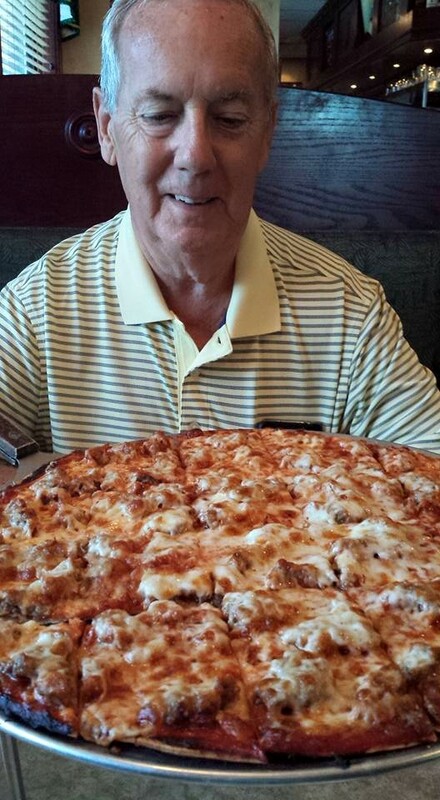 I have mentioned before that Bill’s favorite food is pizza, and his favorite pizza joint is Fox’s, a chain of four or five restaurants on the south side of Chicago. The pizza is thin crust, and he always orders pizza with sausage. Yum…..
We were thrilled a couple of years ago when one of Bill’s favorite Chicago joints opened up a restaurant in Mesa, right down the street from where the Chicago Cubs play spring baseball. Why not? The place is always busy when we are there, and we go quite often. 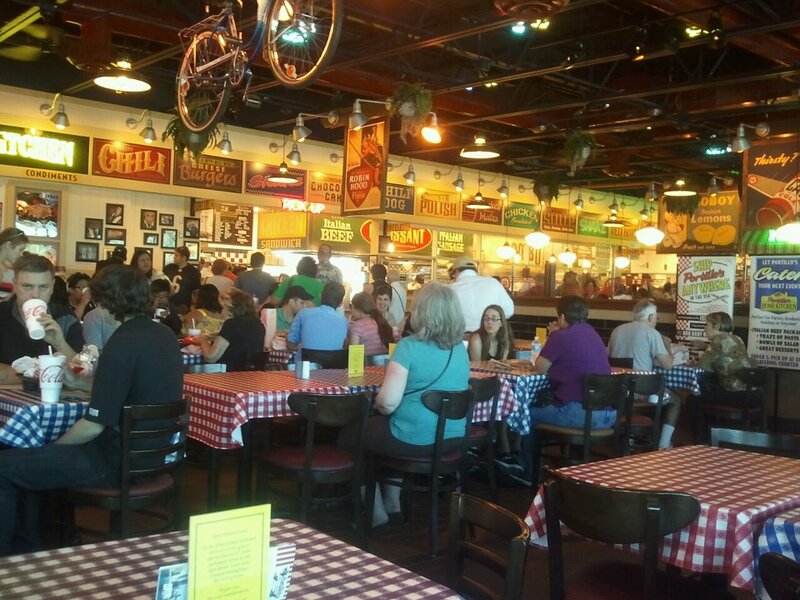 Portillo’s has all of your Chicago favorites – hot dogs, gyros, tamales, hamburgers. But his (and increasingly my) favorite is their Italian Beef sandwich. Italian beef is slow cooked roast beef sliced very thin, served on a roll that is drenched in the “gravy.” It is served with either sweet or hot peppers. Sweet peppers are simply roasted green peppers and hot peppers are similar to giardiniera – a mixture of spicy pickled vegetables. Again, yum. Recently he was hankering for an Italian beef sandwich, and it wasn’t handy to make a quick trip to either Chicago or Arizona. 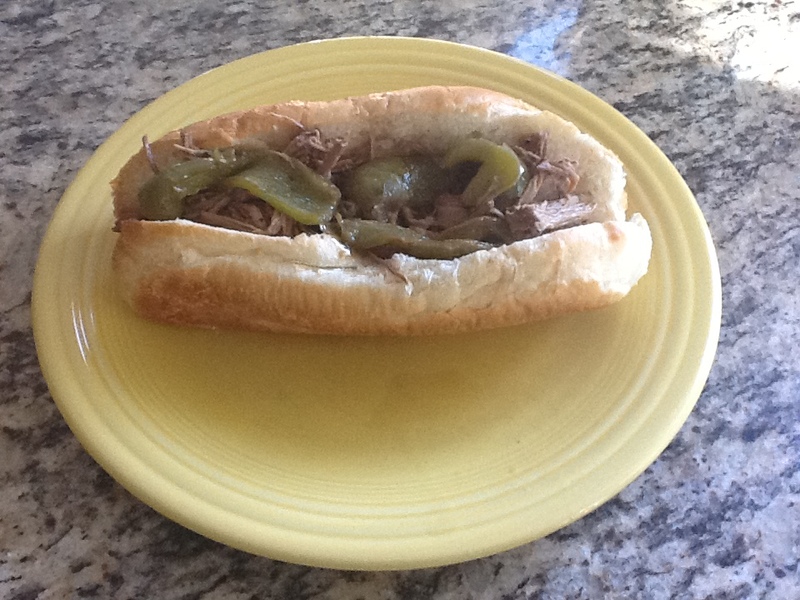 So I tried my hand at it, and found a Portillo’s copycat recipe for Italian beef. I’m no expert on whether or not it rivaled Portillo’s but I will tell you it was good, and satisfied my sandwich loving husband. 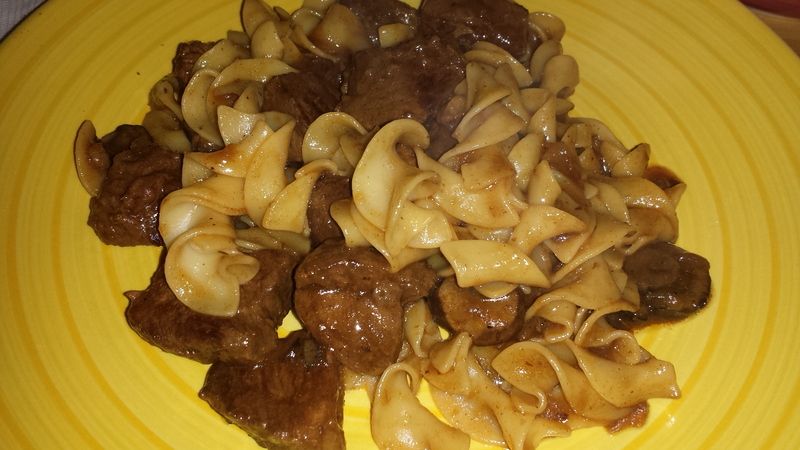 And best yet, it cooked in a crock pot! Soon we will be eating the genuine article in Mesa. But here’s something to enjoy in the meantime…. In a medium saucepan over medium high heat, combine the water, salt, pepper, oregano, basil, onion salt, parsley, garlic powder, bay leaf and salad dressing mix. Stir well and bring just to a boil. Place roast in a slow cooker and pour mixture over the roast. Cover and cook on low setting for 10 to 12 hours OR high setting for 4 to 5 hours. Remove bay leaf and shred meat with a fork. Serve on hard rolls. Nana’s Notes: Genuine Chicago Italian beef sandwiches are made on a certain kind of bread that’s not available here. I used French hard rolls and it was delicious. Also, the genuine article uses roast beef that is sliced VERY THIN. Since I don’t have a meat slicer, I shredded the meat and it worked great. Chicago, don’t hate me. Finally, the test of a true Italian beef sandwich is that it is so sloppy that you have to lean over your plate to eat it. It might be hard to tell from the photo, but this one definitely was.